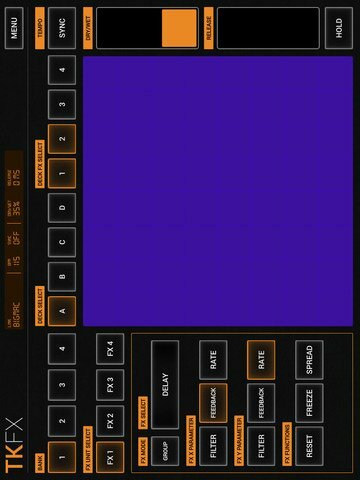 TKFX is a full-fledged Traktor controller for iOS devices. Besides full decks, looper and mixer control with a jog dial included, it allows you to control Traktor effects in a powerful and intuitive way using a X/Y pad for each effect unit. Select the effect you want to use, assign effect parameters to X/Y pad axis, enable the effect in the wished deck and touch the pad. The effect is automatically applied. TKFX is completely plug and play which means that you donâ€™t need to waste countless hours in MIDI mapping. TKFX knows all about Traktorâ€™s decks and effects, just select the deck or effect you want and all itâ€™s parameters and functions will be automatically available on the respective buttons. TKFX supports effects unit operation in single or group mode.